I drove past a cyclist this morning… nothing untoward you would think. He was dressed in hi-viz jacket with a bright yellow crash helmet, and I’m pretty sure he had hi-viz gloves as well, as the overall impression of yellow was quite striking. 1 – It was just after 06.00 this morning (27th October), so was quite dark, albeit the weather was good. 2 – The road was a fast half mile section of straight B-road near Malmesbury with a 50mph speed limit and no street lighting, but there are houses creating ambient lights. 3 – It’s the sort of road where cars readily exceed the speed limit or, of more concern, use the straight to overtake and as a result significantly exceed the speed limit – I’ve had cars overtake me in the previous 30mph section well in excess of the speed, so I wouldn’t be surprised for cars to hit 70mph on the stretch I’m talking about. 4 – The car in front of me on this section was dawdling a bit and I toyed with overtaking before we got into a slower winding section, but decided against it. 5 – However, instead of overtaking, I did take a good look ahead of the car in front and saw nothing coming towards us. It was halfway along this stretch of road that I noticed the cyclist on the other side of the road as we passed him in the opposite direction, and it occurred to me that it would have been so easy to have been overtaking at the time… you can’t dwell on what might have happened, but there was the obvious risk that either the cyclist, the driver that I’d have been overtaking or myself could have been hurt (or worse)… and this worried me. The reason that I didn’t clock that hi-viz cyclist was that he didn’t have an effective front light to draw attention to his presence on the road. I have no doubt that the cyclist had a front light (surely you wouldn’t commute without a front light), but it wasn’t very bright, definitely wasn’t flashing and it got lost in the other light and dusk this morning – so it didn’t highlight the cyclist. Equally good hi-viz kit works well as long as it’s dark (so the reflectivity works to maximum advantage) and the reflective patches are lit appropriately – and unfortunately most reflective patches work from the rear and side of the jacket, not the front, so again there was little to help the hi-viz to standout. There’s definitely a time and a place for yellow hi-vis kit, but in my opinion good (flashing) lights and decent reflective patches are the key for riding in the dark and dusk. 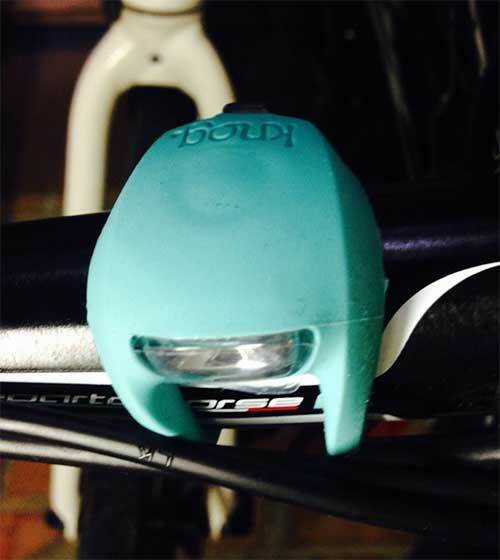 By ‘good lights’ I don’t mean 1000 lumen Cree mountain bike lights that dazzle everyone, but I do mean bright commuter lights with good battery life. When I’m commuting I always run two lights on the front (a Cateye Singleshot that has a static beam to show the road ahead, and a Knogg Frog that flashes to make me more obvious), and I run two flashing lights on the back to maximise my visibility. As to clothes for commuting, I do have a hi-vis jacket, but it’s seen better days so is more lo-vis now – which is probably the case with many commuters. It’s also a jacket and wearing that for every ride isn’t ideal, so my night time clothes tend to be a bright jersey (either a bright green Decathlon thermal top or a trusty Rapha Country jersey in orange), and a wind jacket with some reflective patches for when the going gets a bit nippy. Whether you choose to go with hi-viz yellow or bright orange, what you’re trying to do is make yourself obvious to other road users – to create an impression that you standout and makes them think twice before doing something that endangers you. There are no hard and fast rules about whether hi-vis is the right choice for cyclists, but in my experience (as this morning shows) it absolutely does not work on its own… and is in the second line of visibility defence after proper lights (two of!) and reflective patches.